The Wanaka region offers both beginners and experts a network of 750km of mountain biking tracks. 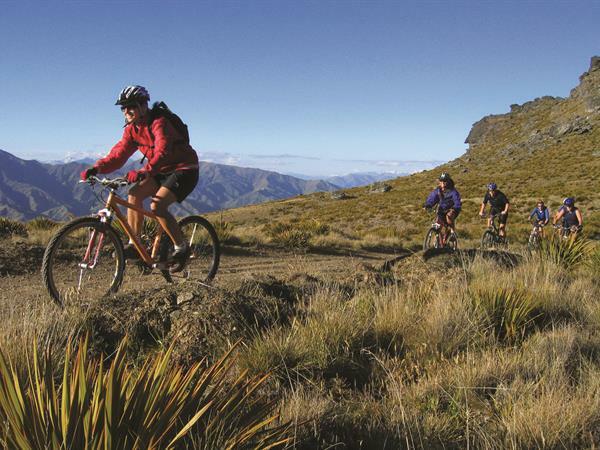 Enjoy the great outdoors and stunning New Zealand scenery on a mountain bike trail or cycling track around Wanaka. From scenic road rides and a dedicated network of tracks with epic views to kilometres of single lane tracks and technical tracks for those who like it steep and tricky, both novices and experts can spends days exploring the Central Otago region by mountain bike. All Distinction Wanaka apartments boast a fully secure garage, perfect for mountain bike storage. Below are just a few of our trail suggestions, for more information please visit... www.bikewanaka.org.nz. An easy, family friendly walking & biking track that follows the Hawea River from Wanaka to Lake Hawea. This riverside walk is over easy country and links Lake Hawea township to Wanaka, via Albert Town. Near its midway point, the track crosses Camp Hill Road. Track construction is to a high standard and is suitable for both walking and biking. This fun network of single tracks makes the best of the pine forest in Wanaka township. There are over 20 tracks to choose from; from the technical switchbacks of Stumpy and Yumpts, to the beautiful berms of Venus, to Crankin' Fine's legendary uphill corkscrew, these trails are expertly designed to be enjoyed by beginners and pros alike. A fantastic one-way cross-country mountain bike loop track for intermediate to advanced mountain bikers. The fast, flowing single track loop weaves its way through typical Otago landscape featuring matagouri and tussock with great views of the Clutha River and Southern Alps. A selection of banks, berms and tight corners appeal to intermediate mountain bikers, with easier riding options around rocks and other technical obstacles. All of the climbs are well-constructed switchbacks with nice flowing downhill sections. Need a bike? Distinction Wanaka offers a great value Stay & Bike Wanaka deal that includes accommodation, 2 hour bike hire and FREE WiFi. Alternatively you can hire bikes from Distinction Wanaka for only NZD$15 per hour or NZD$55 per day for adults and NZD$50 for children. A child seat and baby trailer (2 seater) is also available for NZD$15 per day. Hard trail, fat bike and full suspension options are also available on request. Contact the Distinction Wanaka team to discuss your MTB requirements. The Wanaka region offers both beginners and experts a network of 750km of mountain biking tracks. Enjoy the great outdoors and stunning New Zealand scenery on a mountain bike trail or cycling track around Wanaka. All Distinction Wanaka apartments boast a fully secure garate, perfect for MTB storage. Bike hire is also available.